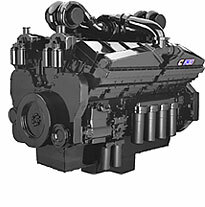 We always have a new stock of diesel engines for sale for a variety of applications. Our inventory features a number of diesel engines in a range of prices and hours run, so you know exactly what you’re getting. And you can trust that the engines we sell are top quality, because we thoroughly examine and service each one to ensure they are working at optimal levels. If you are interested in our current inventory of engines, give us a call. We are a dealer of Cummins, Caterpillar, Deutz, John Deere, Baldor, Detroit Diesel, Scania, Kubota, and Kohler. 1-KTA Cummins Powered 350 KW Prime Generator on skid with circuit breaker. Includes skid mounted radiator with electric motor. Less than 10 hours since overhaul $30,000.